In high school, I didn't really know how to have friends. I was in this weird purgatory of being 15 and wanting to fit in but also being 15 having experienced the death of a parent and feeling soooooo far out. I didn't really understand how to gossip (mostly because I didn't care). I didn't know how to just 'hang out' with people after school and on the weekends because my mind was on a constant loop of, 'mymomisdeadmymomisdeadheydontyouknowmymomisdeadandherewearealivepretendingthateverythingisokayEVERYTHINGISNOTOKAYBECAUSEMYMOMISDEAD'. I ate lunch with my teachers, brought coloring books to class instead of textbooks and kept myself busy after school in the kitchen. There were always a plethora of cookies laying around my house (cough cough bakingismycopingmechanism cough), so eventually I started bringing them to school in a basket. That's when I figured out how to relate to people because everybody loves a good cookie. Soon I was a Wantagh High School mini-celeb - everybody said hi to me, people would chase me down to see what was in my basket that day. At the time I had no idea what that basket did for me, looking back I know that it gave me the courage to talk to anybody and everybody. Chocolate chip cookies were common ground. 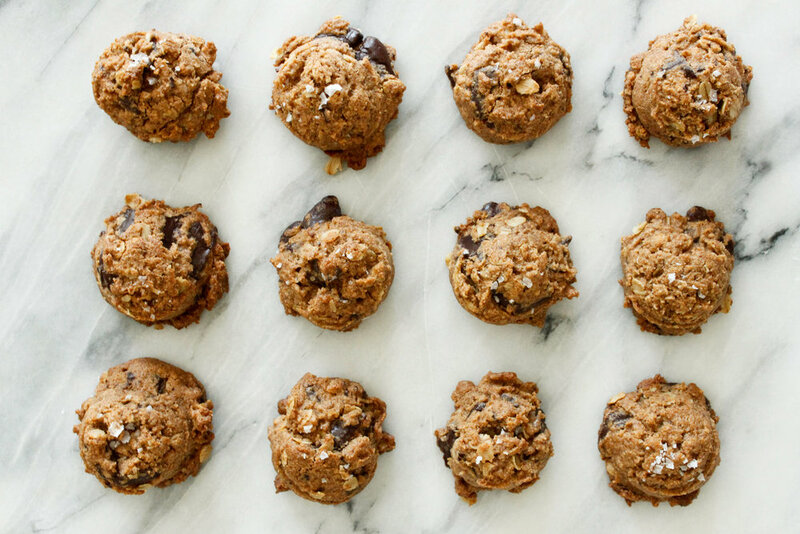 Humans from all walks of life can stand around a kitchen counter and bite into a warm chocolate chip cookie and feel a little bit of home. I was able to feel a little bit of home in a life that felt so foreign to me every time I ate one of those cookies. In 11th grade we read an essay about a couple who had lost their child who kept spending time with the chef who was supposed to make his birthday cake. The lesson of that essay was that food is love. If there's one thing I learned outside of the classroom in high school it's that gifting food is a way to give a little bit of your heart to someone else, and it's only when you share it that you begin to feel whole again. In a medium bowl, mix together the almond butter and brown sugar until combined and smooth. Stir in the applesauce, vanilla and baking soda until mixed in. Slowly stir in the oats, rice flour and chocolate. On a parchment lined baking sheet, drop rounded tablespoonfuls of dough (I use this scoop) at least an inch apart, lightly sprinkle with flaky salt and send off to the oven for 9-11 minutes juuuuust until the edges start to brown and the cookie seems set. Cookies will keep really well in a sealed container at room temperature for up to a week!